A few weeks ago, I was thrilled to check off an item on my bucket list! Through a lot of “bugging” of Hormel Foods personnel, I finally got a tour of the Hormel plant in Austin, MN. For over 35 years we have sold pigs to Hormel Foods and I have yet to take a tour of the plant, that is, until recently. On the morning we arrived at Hormel Foods, I really didn’t know what to expect. Mentally I tried to prepare myself for what I may or may not see. I was sure there would be plenty of “blood and guts” because it is a meat packing plant and that is what happens. The reality is when you raise animals some die and as farmers, we need to know their cause of death (to prevent others from dying). The reason of death is determined by a procedure called a necropsy (similar to autopsy). The necropsy is performed by examining the insides of the pig. So what I am saying is we do see “blood and guts” on our farm. Prior to the tour, we needed to sign disclosures and an agreement to follow safety precautions. When we arrived, we stopped at the guarded gate for security clearance. We then promptly met up with a few other pig farmers, who just so happened to be fellow pig farmers from our county. There were a total of nine of us and we were split into two groups. We all were required to wear hair netting, a hard hat, ear plugs, safety glasses, a frock and disposable rubber boots. Yep, we all looked cool. We were not allowed to take pictures. In fact, someone took out their phone during the tour to look at the time and was quickly asked to put the phone away. Our tour was split into two parts – the first part of the tour allowed us to see where the hog carcasses were processed into the fresh meat products and other marketed parts of the pig. Let me just say, there really is very little that is not used from a pig. The second part of our tour was the area where pigs are delivered by truck and moved to the harvest floor. When we walked over to first part of our tour at the processing plant, the very first thing I saw were whole pig carcasses (less the hide) hanging upside down on hooks overhead. We literally had to duck underneath these carcasses as we toured (yes, you had to get the timing down as you ducked or you would be whomped in the head by a hog carcass!). My first impression of the pig carcasses is how they all looked the same–only slight differences in size. And I know Hormel Foods has a preferred weight range. In fact, pig farmers are rewarded if their pigs fall into specific weight ranges and other meat quality parameters. Just as an example, 95% of our last group of pigs sold met those specific parameters. 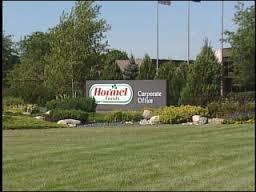 Hormel Foods is a large employer and employs over 25,000 people. Also noticeable about the employees is how diverse the workforce is. In the Austin school district there are over 50 languages spoken. Simply put – Hormel Foods is Austin, MN and Austin, MN is Hormel Foods. I can’t over emphasize the huge presence Hormel Foods has in the city of Austin, MN and how much they give back to community projects. Hormel Foods takes care of Austin and Austin takes care of Hormel Foods. Period. Now onto the tour . . .
USDA presence is everywhere. We saw numerous USDA personnel throughout the plant area. How did we know who the USDA personnel were? By the color of their hard hats. 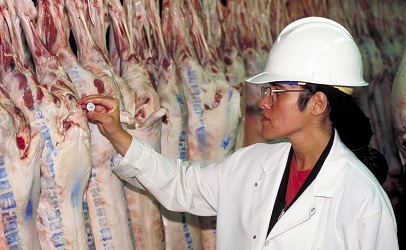 USDA is there to ensure proper handling and quality control measures. Some of the meat cutting processes are handled by machine, while others are performed by humans. It was noted that some of the more delicate meat cutting procedures are done by humans because humans do a much better job. Automated and mechanized cutting machines were used on meat cutting processes such as cutting into carcasses and bones. Throughout the tour I never felt the employees were in a dangerous situation, nor did I feel the workload was too much for any of the employees I observed. My impression of the employment environment was good. Odor was not an issue. Temperatures were comfortable. During breaks and lunch, the entire line shuts down. I never saw stressed employees. I asked where tests were given to determine if there is any antibiotic residue. The answer is the kidneys. Animal identification is maintained in case a pig needs to be condemned. I was truly amazed by the amount of pig parts that are used in the pharmaceutical and medical field. Over 40 pharmaceuticals and medicines are derived from pig co-products. The pig’s pancreas, stomach lining and small intestine are used to produce Insulin, Heparin and Pepsin. Pig heart valves are used in humans. It’s unbelievable all the medical uses that come from pig co-products. The livestock receiving area is where the pigs are unloaded from trucks and moved to the harvest area. When pigs are unloaded from the trucks, the group is immediately put into a pen by themselves and given water. They rest in this pen for a bit, which allows them to be more relaxed. Stressed pigs do affect meat quality (in a negative way) so it is the goal to treat them in the least stressful way. How are pigs moved from one area to the next? 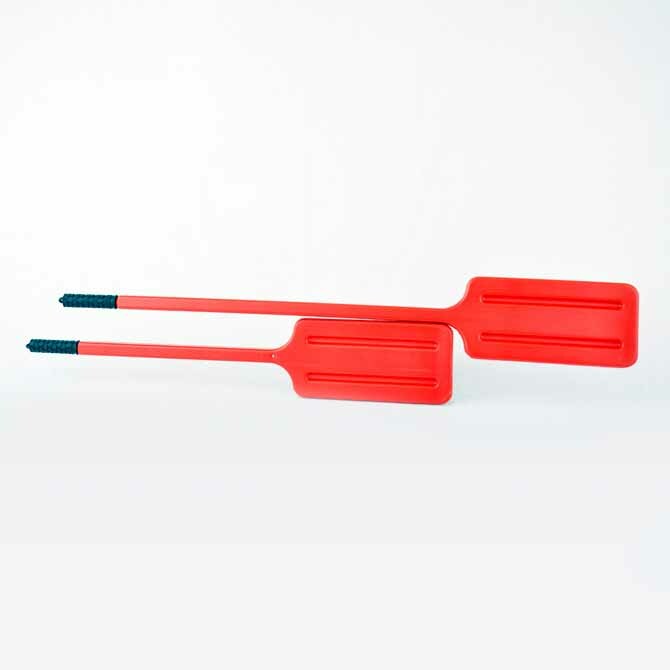 Employees use rattle paddles to move pigs from one area to another. We use these on our farm also and checkout this video on how we use them. Video cameras are always in operation when pigs are unloaded from the trucks. A third party company monitors the video to ensure Hormel Foods employees are following strict animal welfare standards. If an act violates standards, USDA and company officials are notified and can shut the process down immediately. An example of an infraction is when one pig steps over the top of another pig (considered a stressor on pigs). Measures to prevent this infraction are followed by both truck drivers and Hormel Foods employees. The company’s animal welfare standards mirror the Code of Federal Regulations under 9 CFR 313. For example, dragging a non-ambulatory animal, moving them at faster than a normal walking pace, not providing access to water at all times, or an animal that isn’t properly electrically stunned all are violations and the plant can be shut down if they are violated. One animal management tool they use is very unique. They have a light system that shows the colors green, yellow and red based on the volume of noise. The yellow light is an indication the noise level is increasing, which indicates more stress on the pigs. When the red light turns on, it’s a visual indicator that the pigs are too loud (indicating stress) and handling employees need to slow everything down immediately. The actual area where the animal is harvested probably bothered me the most. And it really wasn’t how they were harvested because it truly was the most humane way. I think it’s the direct realization and reality that pigs are our food source. They are making the ultimate sacrifice for our well-being. The actual harvest process is done with a “stun gun” type of process. The electrical current puts the pig in a state similar to surgical anesthesia. They don’t move and don’t feel a thing. The throat is then cut and they bleed out. Pigs that are non-ambulatory, or pigs that are unable or have significant difficulty moving are also handled with care. If a pig cannot move but is still alive, a skid loader type of equipment is used. On the bucket of the skid loader is a conveyor belt which gently moves the pig into the bucket. The pig is then moved to a special pen. And the reverse process is used by reversing the conveyor belt. This method is unique to the Hormel Foods plant and it is a very gentle process as we were able to witness it. We did not tour the area where the processed meat takes place, such as Spam®, Hormel Black Label® bacon or Hormel Cure 81® hams. I hope to tour these areas in the near future. Did you know that Spam®, which most people think of when they think of Hormel Foods, is made from seven ingredients? Ham, shoulder, salt, water, potato starch, sugar and a small amount of sodium nitrate. It was an important food item for soldiers during World War II and continues to be an available food across the world. All and all, I am glad I took the tour. I was truly impressed with what I saw and it makes me appreciate the complexity of our food system. It is obvious that Hormel Foods takes pride in it’s employees, it’s support for the community and it’s mission to provide safe and affordable food for consumers. What an interesting article. I was looking to see if the general public could tour the plant, but after reading this I can see why not. Thanks for posting this. More people should know about what goes on. It really was a great tour. And it took me many years to finally see the plant. As a vegetarian, I am constantly plagued with dogma about the food industry. But I am a realist, I understand the world is hungry place, and these food processing plants are a driving force in stopping hunger in our nation. I found this article well written and informative. I’m happy to hear that USDA, humane conditions, and safety for employees is valued in large corporations that usually have bad reputations for their size. Thank you for your insight. Thank you for your respectful comment. GREAT article! I was there about 50 years ago on a FFA field trip. Sounds very similar to what I remember. Thank you for sharing this story about meat processing! Thanks! I am glad I toured the plant. I learned quite a bit about what happens to our pigs when they leave our farm.